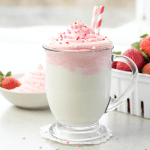 White Hot Chocolate with Strawberry Whipped Cream is a cocoa made with white chocolate chips, whole milk, heavy cream and vanilla extract on the stove-top or in the slow cooker topped with an easy whipped cream made of heavy cream, strawberry Jello and confectioners sugar. School was cancelled today because of the freezing cold temperatures outside. Like many places at the moment- Cincinnati is experiencing some serious low temperatures so what do we do? Drink hot chocolate, duh! 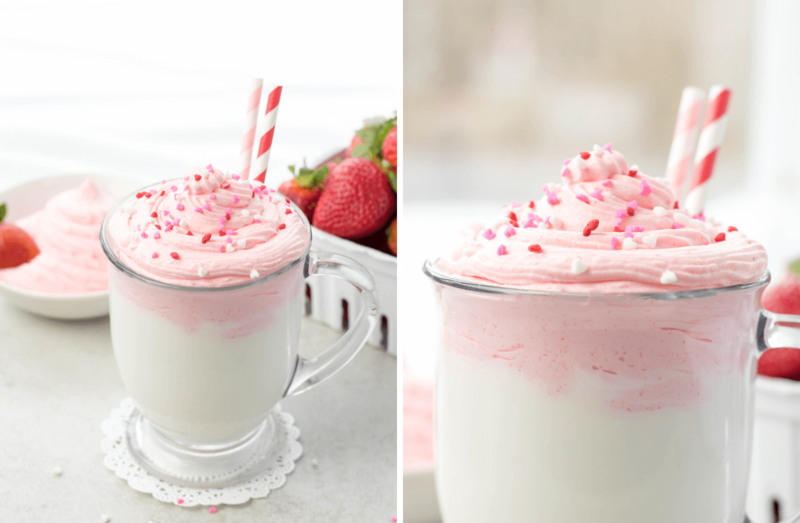 We didn’t want any hot chocolate though so we made it special today with a strawberry whipped cream topping and Valentine’s Day sprinkles and it is just what we needed on a day like this. White Hot Chocolate can easily be made in the handy crock-pot or quickly on the stove top. Stove Top: Add the chocolate chips, heavy cream , milk and vanilla extract to a saucepan or pot. Cook on a medium heat and whisk frequently until you reach a low simmer. Serve. Crock Pot: Add your ingredients to a crock-pot and cook on low for 3 hours. Serve. 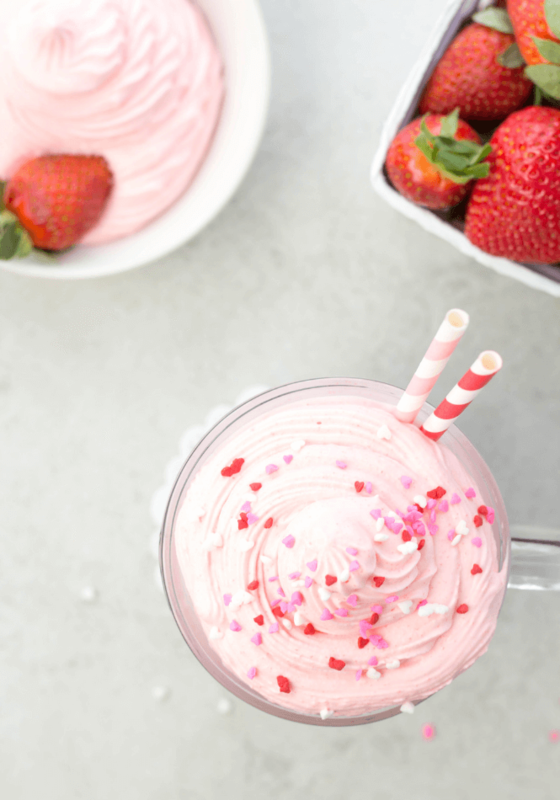 Time for that special touch of strawberry whipped cream. This tastes like a normal fluffy, slightly sweet whipped cream but with the added bonus of strawberry flavor! Plus, it is really easy to make. Before beginning, place a metal bowl and the beaters into the freezer for 15 minutes. After 15 minutes is up, add the heavy cream, confectioners sugar, and a little bit of Jello gelatin powder in strawberry flavor to the cold bowl. Beat for 4-5 minutes you get a stiff peak – meaning it will hold firm but still look soft and fluffy. 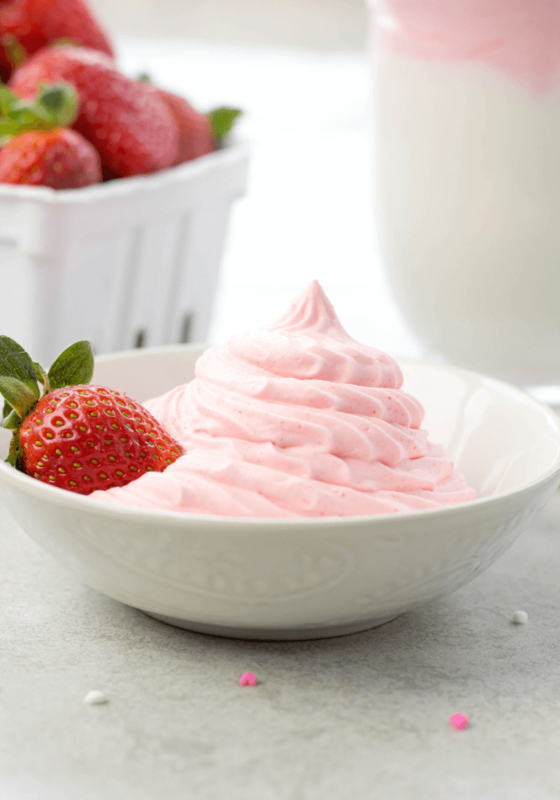 Think of all the delicious desserts you can use this strawberry whipped cream on! YUM. Place a metal bowl and beaters into freezer for 15 minutes. Add 2 cups heavy cream , 1/2 cup confectioners sugar and 4 Tablespoons Jello gelatin powder into the metal bowl and beat for 4-5 minutes or until a stiff peak forms. Store in fridge. In a pot or saucepan, add the chocolate chips, 2 cups whole milk, 2 cups heavy cream, and vanilla extract. Cook on a medium heat stirring often as you bring it to a low simmer. Serve the hot chocolate in a mug with some strawberry whipped cream on top and add some sprinkles for fun! 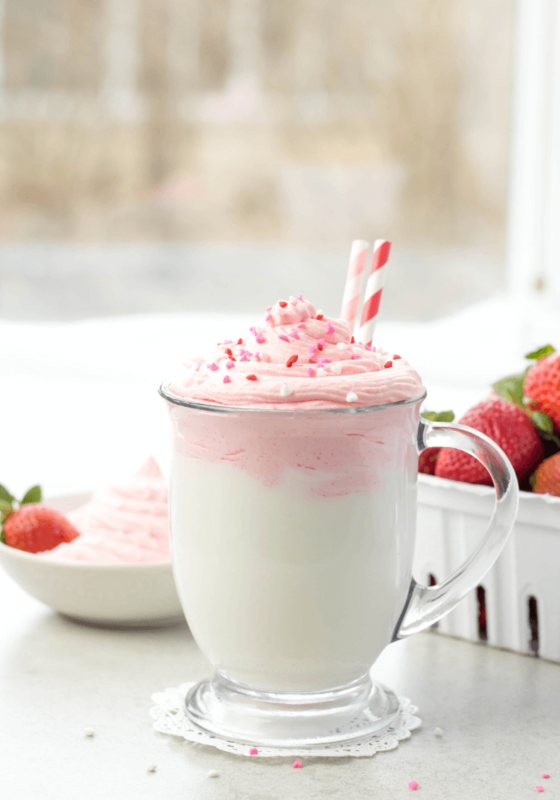 After making this strawberry whipped cream for our white hot chocolate, I am thinking of all kinds of fun flavors and ways to eat whipped cream! Do you have any amazing flavor ideas? Let me know in the comments below. I love hot chocolate but so rarely drink it, usually, when I’m traveling I’ll splurge for a cup. I will absolutely be making this. CAn’t wait to try it! I am the same way. It is such a nice treat. So warm and chocolatey and the strawberry whipped cream is a nice refreshing touch. I have never had hot white chocolate. I think this sounds amazing. I can’t wait to try it. Hmmmm Yum! This looks so delicious! Can’t wait to try this one at home! My kids would absolutely love this! 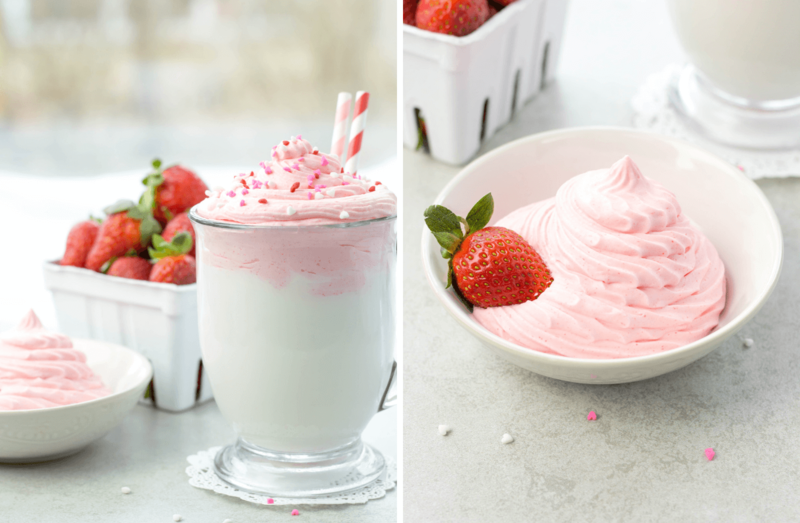 The strawberry whipped cream is such a nice (and pretty) touch. 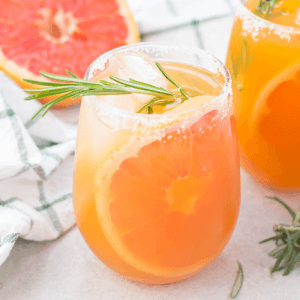 Adds a nice flavor and yes, so pretty! I’ve never tried making white hot chocolate, but yours looks so amazing! I really want to try it now. You must make it! It is so delicious.